Nirmalamma (1920 – February 19, 2009) was an actor in the Telugu film industry of India. She has acted in more than 800 films. She was well known for her grandmother roles in several films. Her debut film was Garuda Garvabhangam in 1950. Nirmalamma has worked along with almost all famous artists in Telugu Cinema like P. B. Srinivas, NTR, ANR, S.V. Ranga Rao, Rajendra Prasad, Venkatesh and many more. She is one of the artists who appears in almost all of the movies of S.V. Krishna Reddy and E. V. V. Satyanarayana. She has had unforgettable roles in the films Chinnodu-peddodu, Padaharella Vayasu, Kanakamahalakshmi recording dance troop, Gang Leader, Mayalodu, Egirey Paavurama, Rendilla Poojari, Devatha (Shobanbabu's movie), Chinnarayudu, Dalapathi, Alibaba Aradajanu Dongalu, Sitharatnam Gaari Abbayi, Mamagaaru, Aa Okkati Adakku, Karthavyam, Chalaki Mogudu and Chadastapu Pellam.She has established Nirmala Arts and produced Chalaki Mogudu Chadasthapu Pellam starring Rajendra Prasad, directed by Relangi Narasimha Rao.Her last movie was Premaku Swagatham, directed by famous director S.V. Krishna Reddy. 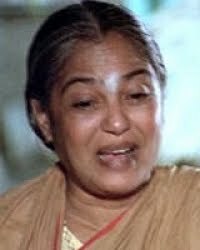 Her last public appearance was in the Vajrothsava celebrations of Telugu cinema where many celebraties remembered her the fact that she has played as mother/grandmother for many generations of Telugu Cinema. She had no natural children but did adopted a child. She received the Nandi Award for Best Supporting Actress for her role in Mayuri.